Ohio State’s Dwayne Haskins, shown here earlier in the season, said he is receptive to running but has had success throwing. 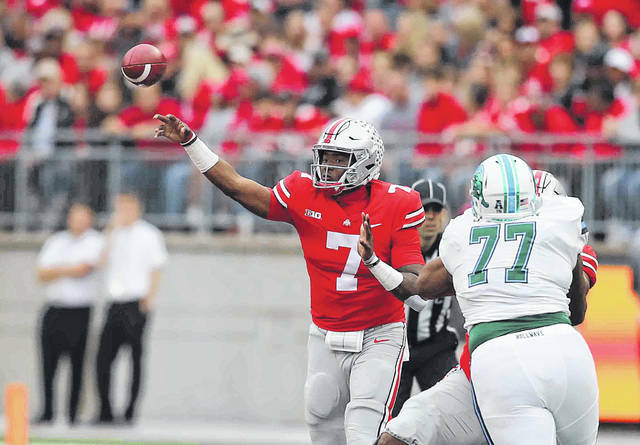 COLUMBUS – Ohio State quarterback Dwayne Haskins says he’s OK with running the football, in fact he likes to do it even though he hasn’t done much of it this season. “I do like running. I’d rather sit back and throw the football because that’s what I do. But if I need to, I can do it,” Haskins said after practice on Tuesday. Haskins has thrown for 3,053 yards and 32 touchdowns, which is tied for first nationally, and has completed 69 percent of his passes in his first year as a starter. But he has gained only 45 yards on the ground and has run for one touchdown in OSU’s nine games, quite a contrast with the two quarterbacks who dominated that position in Urban Meyer’s first six seasons at Ohio State. Last year’s starter J.T. Barrett rushed for 3,263 yards and 43 touchdowns in his career and Braxton Miller ran for 3,315 yards and 33 touchdowns in the three seasons before Barrett became the starter in 2014. OSU coach Urban Meyer often referred to Barrett’s ability to pick up short yardage as a “get out of jail free card” for the Buckeyes’ offense. So far this season, Haskins has been more likely to throw the ball in those situations. And when he has run he has not appeared very comfortable doing it. He never looked less comfortable than he did on a carry against Nebraska last Saturday when he went into a slide probably five yards sooner than he had to. When Haskins led Ohio State to a come-from-behind win at Michigan last season after Barrett was injured, he had a 22-yard run where he dived for the end zone and came up just short of the goal line to set up the go-ahead touchdown. So, how could he look so aggressive on that run and kind of tentative on most of his runs this season? Ohio State (8-1, 5-1 Big Ten) plays at Michigan State (6-3, 4-2 Big Ten) on Saturday. The Spartans lead the country in fewest rushing yards allowed per game (71.7). But Maryland and Illinois are the only Big Ten teams who have given up more touchdown passes than the Spartans. Haskins says he has been studying MSU’s defense and one of the sources he mentioned was a little surprising and might have added a little more fuel to Michigan State’s rivalry with Michigan. “I’ve watched like five games of Michigan State since Sunday. I talked to (Michigan quarterback) Shea Patterson. He played them earlier in the year,” Haskins said. “I’ve known Shea since I was in the eighth grade. We played in an all-star game together, we were at Elite 11 and all that kind of stuff. So, I hit him up and asked him how they played defensively and he just gave me some tips going into this week,” he said. Michigan State had similar statistics against the run coming into its game against Ohio State last season when it ranked third nationally, allowing 87 yards a game on the ground. https://www.limaohio.com/wp-content/uploads/sites/54/2018/11/web1_OUS-vs-Tulane-DS-6.jpgOhio State’s Dwayne Haskins, shown here earlier in the season, said he is receptive to running but has had success throwing.